I have China Glaze 2009 throwback for you today. I must admit this polish had not seen the light of day for awhile, and I can see why. This one was a "it" polish when it came out. Everyone wanted it, it was a favorite from the collection it was part of. Atlantis is a teal jelly base packed with silver holographic glitters. Color: This deep teal base that leans more toward the green side. I don't know if was always like this or if maybe the polish has aged a bit, but I really could use more punch of the base color. It doesn't pop as much as I'd like. Formula: This formula is on the sheer side and still after 3 coats you can see my nail a bit underneath. The formula was easy to use though. Price: This is easy to find on many e-tailers in the $5-$8 range. Overall: This really doesn't do anything for me anymore. I have a feeling this polish may have aged too. I really think the based has yellowed a bit, and I remember the glitter really sparkled. This just kind of looks dull to me? I'm not sure this really holds a candle to what is out there now especially with indies. 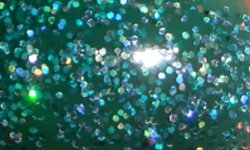 Jelly glitters and glitter polishes have advanced so much that Atlantis just doesn't measure up in my opinion. I don't hate it and it's not terrible, but it's not something I see myself revisiting again. I feel bad because maybe age did a number on this formula? Scrangie's swatch from 2009 is how I remember this one. It looks really nice there, but mine doesn't look like that anymore. If you have this color let me know in the comments if you've noticed yours looking a little sad? I haven't worn my Atlantis in forever but it is still a gorgeous color!! I didn't wear mine for a couple of years, but I picked it from my stash some days ago and I know how you feel. I've noticed that a lot of bases seem to yellow with age; Orly Love One Another (I think that`s the name) is a great example. I have a new bottle and I've also seen older bottles in blog sales. Older ones are very yellowed, while my new one is clear. Yes mine is like yours. I don't wear it anymore but I have kept it because of the memories lol. Thank You For Being A Friend Giveaway! Throwback Thursday: JulieG Oh Em Gee!